欢迎 您 来 到 国 家 公 园, 到 您 的 渡 假 屋 或 旅 馆 登 记. 08:30pm Experience night jungle walk with nature guide and visit Tahan Hide and see the nocturnal animals come alive! Bring along torch-light! 11:00pm Good night! Sweet dream. 进入梦乡. 09:00am Jungle trek to Teresek Hill (344m). From the hilltop and in clear sky you may be able to see the peak of Gunung Tahan.Continue to challenge the longest canopy walkway in the world which was installed above 40m and stretching above 500m long. 03:30pm Experience daily life of the natives at Orang Asli Village. Try out various hunting skills such as rapid shooting. Swimming at riverside at Nusa Camp. 10:00pm Good night! Sweet dream. 进入梦乡. 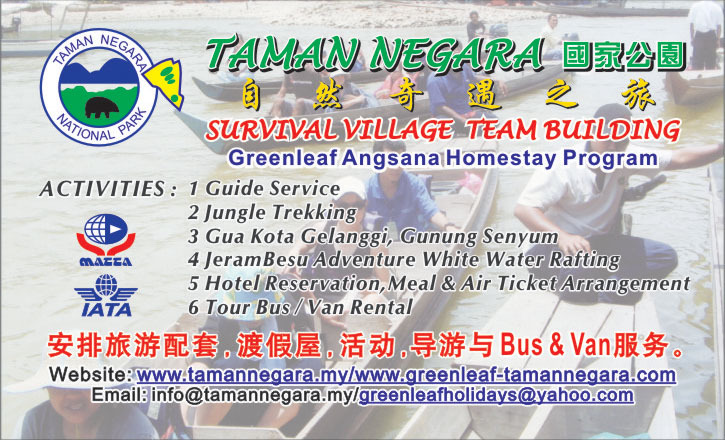 Check-out and leave Taman Negara. Boat ride to Lata Berkoh Cascades (waterfalls), along the protected Tahan River. Enjoy the cool, refreshing air, and the natural beauty of rainforest along the ride. On the way back, visit the Kelah Fish Sanctuary. Feed the fishes and come in close contact with them(Visiting the Sanctuary is subjected to permission from the local authority and river condition). - Entry permit and Camera License RM5 per camera. 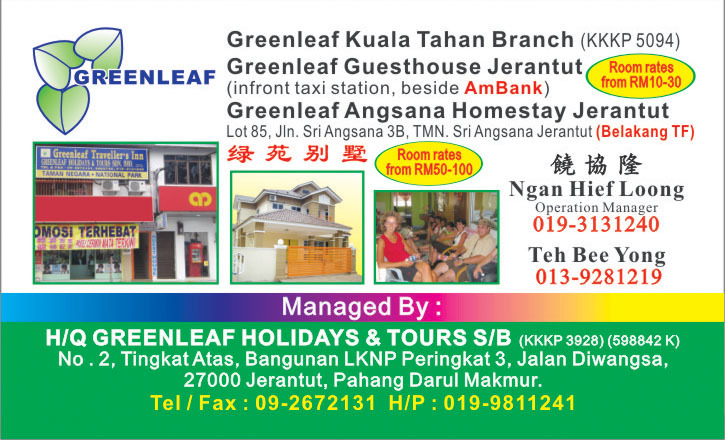 - Lata Berkoh MYR200.00 per boat maximum for 4 person. - Lunch and Dinner not include.